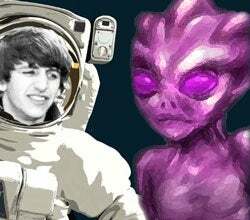 Space Aliens First to Get DRM-Free Beatles Music? Click to viewYou may have heard that at 7pm EST on Feb. 4, NASA plans to blast The Beatles' song "Across the Universe" into deep space in order to serenade otherworldly beings hundreds, thousands or millions of light years away with our very best pop music. I have several problems with this. For starters, NASA: You got the choice of the entire Beatles catalog, and you pick a song only because it contains a relevant metaphor? I mean, have you ever listened to Revolver? Wait, actually, you clearly must've, since Paul McCartney performed "Good Day Sunshine" in Nov. 2005 for the astronauts aboard the International Space Station. If you're aiming at aliens, why not choose something a little less intelligible, like "Dig a Pony," "Come Together" or "Tomorrow Never Knows." If those weren't written for space aliens, I don't know what. And finally, a message to the Crab people: Don't trust these downloads. You'll see the file streaming into your antenna array and you'll be like, "Sweet! Free music!" But then you open the file, and you get this message on your Crab Nebula equivalent of Windows Media Player 11, saying that in order to enjoy this track, you need to get authorization from a central server. You click okay, and the message has to travel back to earth, taking another 50,000 years or so. Which may seem worth the wait, only the track itself expires in 30 days.